Museums are more than just somewhere you are forced to go on an elementary school field trip. After you grow up (and are no longer required to go) you find out they are nice. Even tasty in some cases. Whatever your interests there is a good chance a museum devoted to it exists somewhere. Unfortunately many museums have little or no budget available for marketing and go unknown. Food, music, military, fine and performing arts, outer space, underground and on land, water and wheels ~ pretty much anything goes. Below are the ones I believe should make someone's bucket list. 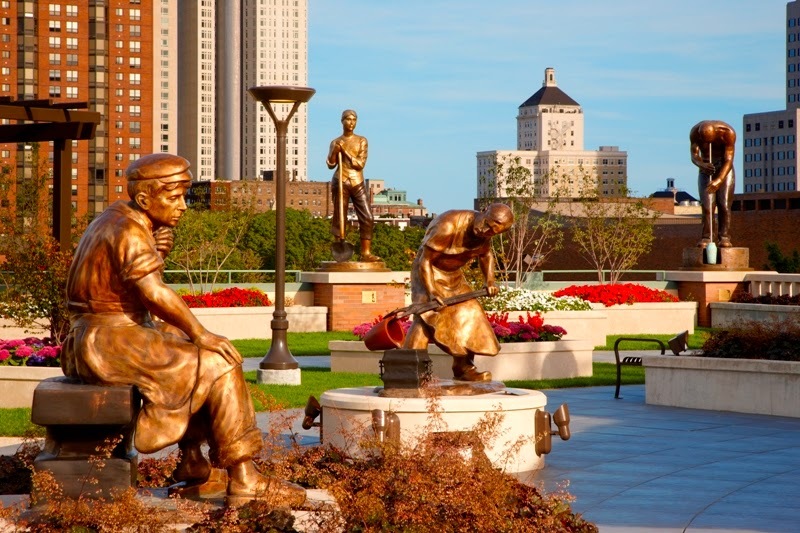 More than 1,000 paintings, mosaics and sculptures line the walls, floors and rooftop paying homage to the laborers throughout history in the Eckhart G. Grohmann "Man at Work" collection, located in Milwaukee. The passion of Dr. Grohmann encompasses works (from 1580 through post WWII era) depicting farmers, glass blowers, miners and other trades people he had watched as a child in Germany. Dr. Grohmann happened to be in the museum when I visited and proved to be a delightful and gracious host, passionate in his respect to working men and women, stemming from his days spent at his grandfather's marble processing plant. Is there anyone who hasn't had a hot dog slathered with the bright yellow goo known as mustard? With literally hundreds of flavors, mustard is the new black in the world of condiments. Located near Madison, in Middleton, Wisconsin is the coolest of quirky when it comes to museums. From the hundreds of different types of mustard to try (and purchase), to Poupon U mustard university, to the fresh pretzels and hot dogs in house to eat for lunch with, what else, mustard, this is the only museum devoted to the yellow spread. Spicy, sweet, maple ~ even chocolate ~ can be found in a jar, bottle or tube, along with mustard serving spoons and dishes dating to the beginning of mustardom. This is one of those museums adults love to go to even though they'll pretend it's really for the kids. The scientific section of the Cranbrook Educational Community in Bloomfield Hills (metro Detroit), is the ultimate spot for learning about the world around us. Featuring, among many other areas, a Bat Zone, planetarium theater, observatory, and plant gardens, summer programs are also popular, along with overnights and themed lectures and galeries. From The Everly Brothers to The Beatles and on to Van Halen, music has been a part of American history as the inventor of the rock and roll genre. The coolest list would not be complete without the Cleveland, OH music pillar. Fans flock from around the world to see thousands of artifacts including, concert posters, instruments and rockers' jewelry among other items. Exhibits, live entertainment and inductee ceremonies give music lovers a one-stop venue to enjoy all that is Rock and Roll. Highlighting the masters of magic through thousands of artifacts, the Marhsall, MI shares the history, memorabilia and artifacts of such famous magicians as Harry Houdini and Harry Blackstone, among others. Children and adults alike will find fascinating items in this educational and fun museum. Gifts, books and magicians' coins are available in the gift shop. Supported by the National Endowment of Arts, research appointments are available at the archive center which houses more than four centuries of information about magic and magicians. Located in Indianapolis, this museum is one which will surprise you with the background story. The history of the Old Pathology Building places it on the campus once used as the Central State (Mental) Hospital. The National Register of Historic Places building features an autopsy room, amphitheater lecture hall and three clinical laboratories used in the beginning era of psychiatric medicine. On the grounds, also, is the Medicinal Plant Garden, featuring more than 90 medicinal plants for education and demonstration purposes. It is maintained by Purdue Master Gardeners of Marion County. St. Louis is the home to the Cardinals, the Arch and the Mighty Mississippi River, it's true. However, this hands- and feet- on interactive museum might be even more popular. The 10-story spiral slide begins on the rooftop where you'll find a school bus hanging off the building's edge and various midway equipment (still working and safe). It will wind you down through floors of enchanted caves, the shoelace factory and MonstroCity. Tours, educational programs and age-appropriate activities solidify the learning-through-fun premise. Few literary figures elicit a museum, and this is a personal favorite author from my childhood. A town of sorts, complete with Grant's era-replicated drug store, Becky Thatcher's home, Twain's boyhood home and father's law office. Merging Twain's actual childhood and literary characters creates a 3D historical situation. Interactive events (whitewashing the famous fence) free outdoor musical concerts and walking tours of the eight building compound make this a family friendly museum. Located just west of Chicago is Cantigny Park, 500 acres of gardens, golf, camping and picnic grounds open to the public, along with two museums. First Division Museum preserves, interprets and presents the history of the U.S. Army's 1st Infantry Division, "in order to promote understanding of American military history and affairs." Gardens, live music evenings and exhibits, such as "WE NEED YOU! Propaganda of the Great War," and the Historic Military Vehicle Collection make this a museum, gardens and park not just for military, history and vehicle buffs. Step back in time to a world changing rapidly at the 1879 home of barbed wire entrepreneur, Isaac Ellwood, situated in Dekalb, IL. The three-story mansion features original Victorian style architecture and Gothic Revival, Georgian and Colonial Revival styles through subsequent remodeling projects. Gardens, exhibits and the home are open to the public for tours, events and an extensive interactive youth program, which focuses on art, history and nature. Children will be able to hunt for replicas of sea life, dragons and other creatures within paintings, carved into wood and throughout the mansion. Elizabeth J. Musgrave is a syndicated fine-living, travel, food, wine and spirits columnist, freelance writer and photographer, and performing arts and restaurant critic for Gotta Go. Catch her as Indy’s Personal Lifestyle Adviser on Indy Style, WISH8 (CBS). Read Infused, her spirits, wine & beer lifestyle column, at www.GottaGo.us and www.FoodDigital.com Gotta Go is published on www.Gottago.us, and in magazines. Follow her on Twitter @GottaGo, LinkedIn and Facebook. Yes, the blog, magazine articles, television and radio segments, are pleasure-based ~ I do not cover politics, crime, etc. As far as being ego-based; this is a blog ~ basically the column from when it was syndicated in seven newspapers. So yes, it is taken from my perspective as that is what columnists do. My comment about children being forced to go on field trips in elementary school was neither biased, nor ignorant ~ it was tongue-in-cheek. This article, which has been printed in more than one magazine and discussed on television, also, clearly states there are wonderful museums (not only art), which are worth the drive and time. As far as my "disservice to the arts in Indiana," I wholeheartedly disagree with you, ma'am. In fact, I have been thanked numerous times over the years for all I have done, through writing, radio and television, to promote the arts, as well as, non-art related events, venues and activities. Perhaps some of those parents who do not take their children to art museums might see this blog and go to a different type of museum. Isn't any broadening of their horizons a good thing, or do you feel only art museums are acceptable? Art is beautiful, but not everyone cares (or is able) to visit one, particularly with prices rising for entry. This just might tempt them to go, or at least that is the intention, and has been my understanding, through others, to have occurred.